At his side all the way was his assistant between 1799 and 1804, a loyal cat called Trim. Almost 200 years after the death of Trim, however, a movement started to restore the memory of Trim to its rightful place in history. 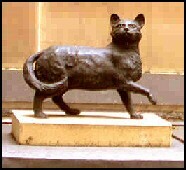 Bronze cat-prints were placed at the base of Flinders' sculpture. A bronze sculpture of Trim was installed on a window ledge, looking up at his friend and fellow explorer. The many writings about Trim by Mathew Flinders were collected together and published as a book called simply Trim.